ECMO is the use of prolonged cardiopulmonary bypass to treat severe respiratory failure in newborns, children and adults. The basic principle is to pump some of the patient’s own blood through an artificial membrane or hollow fiber oxygenator to rest the lungs and give them a chance to heal. ECMO is considered a highly invasive, high-risk therapy. It is used only when there is a high mortality risk with conventional therapies (drugs, mechanical ventilation). The ELSO registry shows modest declines in neonatal ECMO in the last decade but significant increases in both pediatric and adult ECMO over the same period. The H1N1 Flu virus resulted in an increase in the number of adult ECMO cases. A small percentage of adults are struck with severe cases of the flu that result in Adult Respiratory Disease Syndrome (ARDS). This can progress to life threatening complications for which ECMO is one of the last resorts. Thus many centers are adding adult ECMO units that will require a Transonic Flowmeter and Flowsensor. 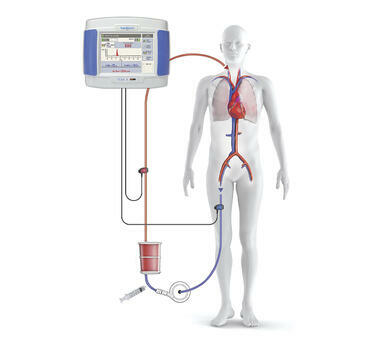 An ECMO circuit consists of a blood pump, oxygenator, and a heat exchanger to warm the blood. Two types of ECMO are performed, veno-arterial (VA) and veno-venous (VV). VA ECMO reduces the load on the heart and lungs, providing cardiac support in addition to pulmonary support. In infant VA ECMO, the blood is usually drained from a cannulated internal jugular vein. It is then pumped through the ECMO circuit and returned to the patient via an arterial cannula in the common carotid artery. VV ECMO is used in patients who do not require cardiac support. VV ECMO can be performed with single or double cannula systems. Some ECMO centers are using an additional cannula placed in the jugular vein to increase total venous drainage (the cephalad drain). This is particularly important in VV ECMO to minimize the effects of recirculation of oxygenated venous blood. The cephalad drain is also sometimes used in VA ECMO to increase venous return.